Ted Rossi NYC can be described in few words : Modern. Chic. Classic. Sleek. Edgy. Urban. Ted Rossi NYC was formed in 2003 using their unique designs to smash the ubiquitous and confining language associated with fashion today. Their mission -- to design leather accessories for the discerning buyer; to create accessories that transcend all fashion language barriers. The Ted Rossi NYC Fall 08 Collection includes both handbags and jewelry. 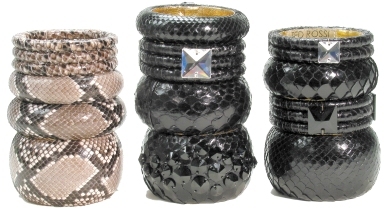 Using ultra-luxurious exotic skins fused with touches of metallic's and Swarovski crystals they have created multi-textured pieces that stand out from the crowd. 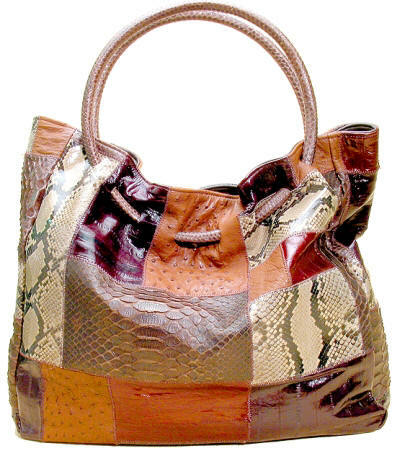 The Ted Rossi NYC Collection is made in the USA from only the highest quality leathers and exotic skins available, including genuine python, ostrich, and eel, to name a few.